Payment Instructions: Accepted methods of payment for this auction are: PayPal, Card on file with Proxibid or call our office with credit card. If you are mailing in a payment, you must email us within 48 hours of auction close that you are mailing in a payment. liz@premiereauctionsgroup.com. There is a 3% processing fee added for Credit Card and PayPal payments. 1 1/4" Columbia Plateau made from attractive material. Columbia River. 1 1/4" Columbia Plateau made from attractive material. Found near the mid-Columbia River. From the collection of Dewey Schmid. Dewey was an early member of the Oregon Arc...morehaeological Society. Excellent flaking and beautiful two-tone Flint color on this 11/16" finely made Columbia Plateau. Excellent flaking and beautiful two-tone Flint color on this 11/16" finely made Columbia Plateau. Found near the mid-Columbia River. From the collection of Dewey Schmid. ...moreDewey's collection was from the mid-river, between the Long Narrows and the mouth of the Deschutes. 1 1/4" Quilomene Bar made from beautifully mottled agate that is semi translucent. 1 1/4" Quilomene Bar made from beautifully mottled Agate that is semi translucent. Found near the mid-Columbia River. From the collection of Dewey Schmid. Dewey was an ea...morerly member of the O.A.S., joining in 1953. 1 1/4" Columbia Plateau that is thin and nicely made from high-quality Jasper. 1 1/4" Columbia Plateau that is thin and nicely made from high-quality Jasper. Found prior to 1955 along the mid-Columbia River. From the collection of Dewey Schmid - De...morewey was an early member of the Oregon Archaeological Society. 1 1/16" semi translucent agate Columbia Plateau. Columbia River. 1 5/16" clear and red translucent agate Columbia Plateau. Columbia River. 1 5/16" clear and red translucent Agate Columbia Plateau. Found near the mid-Columbia River. From the collection of Dewey Schmid. Dewey was a member of the Oregon Archaeo...morelogical Society in 1953. 7/8" Columbia Plateau made from semi translucent dark red material. Columbia. 7/8" Columbia Plateau made from semi translucent dark red material. Found near the mid-Columbia River. From the collection of Dewey Schmid - Dewey was an early member of ...morethe Oregon Archaeological Society. Excellent flaking and style on this 13/16" Columbia Plateau made from attractive agate. Excellent flaking and style on this 13/16" Columbia Plateau made from attractive semi-translucent Agate. Found by Dewey Schmid near the Columbia River, between the Long ...moreNarrows and the mouth of the Deschutes. 2 5/16" well patinated Expanded Base Drill. Columbia River. 1 1/16" Desert Delta is nicely patinated and well styled. 7/8" Columbia Plateau. Columbia River. 1 11/16" Shaniko made from nice semi translucent chalcedony. Columbia River. 2 3/16" Cascade made from attractive mottled Flint. Columbia River. 2 3/16" Cascade made from attractive mottled Flint. Found along the mid-Columbia River by Dewey Schmid. Dewey was an early member of the Oregon Archaeological Society joi...morening in 1953. Set of seven Drills, largest is 1 9/16". Columbia River. Group of 12 assorted Columbia River arrowheads. Largest is 3/4". Columbia River. Group of 12 assorted Columbia River arrowheads, largest is 13/16". Columbia. Nicely styled 4 1/2" Slate Spear point found near San Juan Island, Washington. Nice 20" long strand of Columbia River stone beads. This is a strand of fine stone beads of assorted sizes and shapes, all found by the Buckles brothers near the Bead Pat...morech site in the 1950s. Glenn and Don Buckles were residents of The Dalles and longtime members of the Oregon Archaeological Society. Truly exceptional 3 3/8" Pinto Basin found in Inyo Co.,CA near Bishop by L. L. Valdavia. Truly exceptional 3 3/8" Pinto Basin found in Inyo County California near Bishop by L. L. Valdavia. Ex. Michael Hough collection. Made from gray "sugar quartz" obsidian. ...morePictured in Hothem's Paleo Indian Artifacts, page 121. This is a superb example of the Pinto Basin point type. Beautifully flaked and symmetrical. Pinto Basin points are thought to be the descendents of the Windust point. 1 1/2" Northern Sidenotch made from obsidian found near Fort Rock Oregon. Nicely serrated. 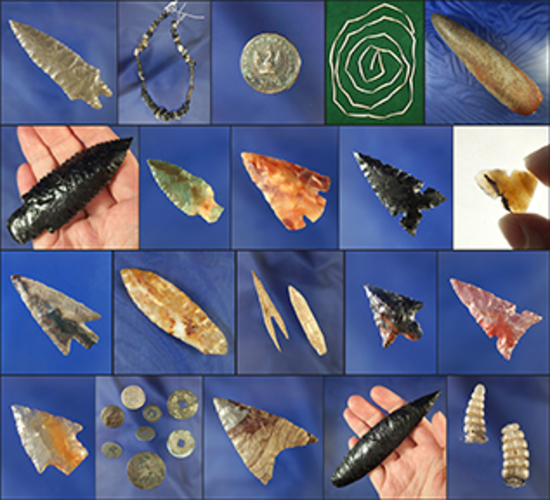 Nice selection of obsidian arrowheads found in Fort Rock, Oregon which are glued to a board. Large slate knife 8 7/16" slate knife found near Klamath Falls, Oregon. Well preserved and intact 4 1/8" Columbia River Awl recovered by Dewey Schmid. Columbia River Bone Awl. Well preserved and intact 4 1/8" Awl recovered by Dewey Schmid near the mid-Columbia. Dewey was an early member of the O. A. S., joining in 1953...more. Large and nice 3 3/4" long Cascade Knife made from beautiful Agatized Wood found near the Columbia River by Daryl Baker who was an early member of the O. A. S. Very nice ...moretranslucent material! 1" Desert Side Notch made from high quality semi translucent material with good flaking. 1" Desert Side Notch made from high quality semi translucent material with good flaking. A micro notched Point found along the mid-Columbia River by Dewey Schmid. Dewey w...moreas an early member of the Oregon Archaeological Society.